For most buyers there are several key areas to a home that is either going to make them fall in love or prevent them from ever stepping through the front door. If you’re going to do work on your home before selling, try to make each room appear lighter, larger and updated. Let’s start with the two rooms that Estate Agents often say sell a home: The kitchen & bathroom. Unfortunately these can often be the two most expensive rooms to modernise so it’s about how to achieve this using budget friendly methods. 1. If you aren’t confident in your DIY skills you can hire professional painters, particularly for the cabinets. You would be amazed at the different a new and fresh colour can make to your entire kitchen when you have your cabinets painted. 2. The same can be said for your splashback, removing the tiles, buying new ones and paying for the area to be re-tiled can be expensive. There are some excellent tile paint choices on the market, just remember to prep the area really well first. Scrub away any build up of residue or grit and spend the time taping around the space. The last thing you want is to end up with tile paint on your countertop or cabinets. 3. Alternatively there are professionals who paint or spray the tiles for a really clean finish. 4. Buyers love quality countertops in stone, granite or quartz and it makes for a great selling point, if you can afford it. A great way to cut down the cost is to choose a thinner piece of stone, it still looks luxurious without breaking the bank. 5. Alternatively, you can have the laminate replaced to freshen it up, choosing a lighter colour to maximise the feeling of space. 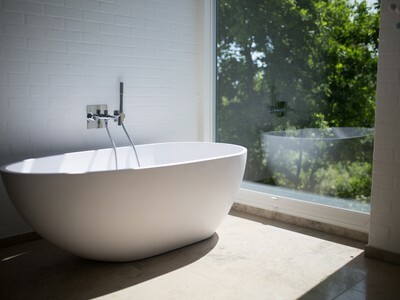 It’s really important to plan a bathroom renovation upfront because costs can quickly run away from you. Tiles, vanities, shower screens, tap fixtures, toilets and labour all add up very quickly. So it’s about figuring out which areas need the most work. 6. If your bathroom is quite neutral then you can think about a new mirror and tap fittings to provide a luxurious feeling. 7. The budget friendly choice for outdated tiles, particularly those that are bright coloured or patterned from more than 10 years ago, is to have them professionally painted or sprayed. If you’re having your kitchen done, it makes sense to include the bathroom in the project. 8. If your toilet has seen better days, you can just replace the top half of it, which is the cistern and seat. This is a very inexpensive way to freshen it up. 9. Have your shower re-grouted. The fresh white covers up any stains from over the years that naturally build up, regardless of how well you’ve cleaned it. There are also areas throughout your home that can really benefit from low-cost improvements to impress buyers and achieve the desired look of light, bright and updated. 11. You’d be amazed how much added brightness can come from a fresh coat of white paint on your ceilings! This includes the bathroom and kitchen, especially if natural light is limited. 12. Painting can be a painful, tiresome job that you may dread doing. If you have a larger property, focus on the main rooms in the home such as the kitchen, dining, living and bathroom. Choose a light, neutral colour that appeals to all buyers. 13. If the job seems overwhelming, have a professional quote on doing the job. Ask them how to cut the cost down, often you can do this by doing the ceilings yourself, reducing the number of rooms or coats of paint. 14. Replace all your lightbulbs, over time the brightness does fade and you want to present a well lit home. 15. If your home does have an issue with natural light, be sure to include floor lamps so the light isn’t solely dependent on the ceiling fittings. Show your Estate Agent how to turn them all on prior to any viewings. 16. An easy way to add light and make a room feel more luxurious is with a statement light fitting. Choose one that isn’t too bold or going to put any buyers off, just something stylish that shines brightly. Have a look at interior design trends for inspiration. 17. Mirrors are amazing for reflecting light and providing the illusion of space. Ideally face these towards windows to make the room appear longer and wider. It can also reflect natural light to brighten the whole room. 18. If your window coverings or dated or can’t be cleaned properly, consider updating them. For a DIY project, you can purchase curtains with a simple rail and install them yourself. This is a budget friendly way to modernise a room. Avoid bright or patterned curtains to avoid alienating buyers. Similar to your paint colour, go for light coloured and neutral. 19. Carpet, particularly if it’s old, can make your home seem more dated than it really is so consider re-carpeting. You can choose a less expensive type of carpet, or ask the carpet company if they have any products on sale. Remember this isn’t about what you love, it’s just to give the home a fresh feeling. 20. If re-carpeting isn’t an option, considering updating the communal areas of the home with lower cost laminate flooring, making sure that it still looks to be of a good quality. 21. This is one of the most important and budget friendly ways to improve the appeal of your home. This is more than just vacuuming and wiping down surfaces. Ideally dedicate a weekend towards a deep clean. Think about window ledges, curtains, appliances, marks on walls, stains on carpets and anything a buyer may notice. 22. If you have the funds, consider hiring a professional cleaner who can steam clean curtains and carpets, deep clean the bathroom and see what needs doing through a fresh pair of eyes. 23. If you’ve considered selling or have sold before, de-cluttering is often the first suggestion made so this one isn’t new but it’s about going the distance. Clear out shelves, what’s on top of tables, dressers and any surface or wall that’s personal or busy. It’s far better to have less in a room than more, a buyer needs to picture themselves living in your home and that’s difficult to do if there’s too much going on. 24. Look up newly built homes online or visit a show home, these are professionally staged and give a great insight into how paired back your property needs to be. Often there’s only 1 or 2 items on a shelf, there won’t be any personal photos and the layout is maximised. 25. You may even consider removing furniture, it’s a bigger job but it can make a room appear significantly larger. Hire a storage unit or ask to borrow a friend or family members garage space during the sale process. 26. If you want to make a real statement, consider bringing in a professional. This can either be to provide advice on what to remove from your home and how to position your furniture or can include renting furniture to present as a show home. 27. 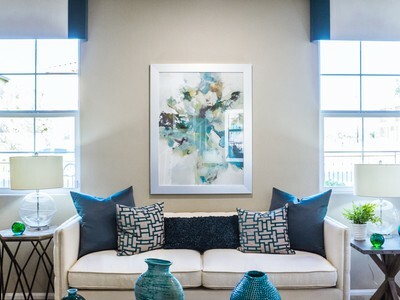 Staging your home is a much more involved process but can be a very cost efficient way for buyers to focus on the feel and style of your home rather than areas that may be more dated and aren’t refurbished. 28. This is the first thing a buyer will see, both online and at a viewing. If it puts the buyer off, it’s very hard to win them over once they step inside. Really assess how your home presents from the street. Are the gardens in good condition? Is the paint peeling or damaged? 29. Consider having a professional high pressure clean the outside of your home to remove cobwebs, dust and dirt. It’s hard when you’re selling your own home to view it through a completely fresh pair of eyes. The best way to do this is look at homes for sale in your area and pretend you’re buying a similar property (you may well be). Pick up on what you love and what puts you off, then compare this to our list above. If you can only do a few of the items, give careful consideration to where the most value will be added. It’s also worth having your local Estate Agent through for their opinion as they will know recent buyer feedback and provide guidance as to where you can most impress local buyers with your home.